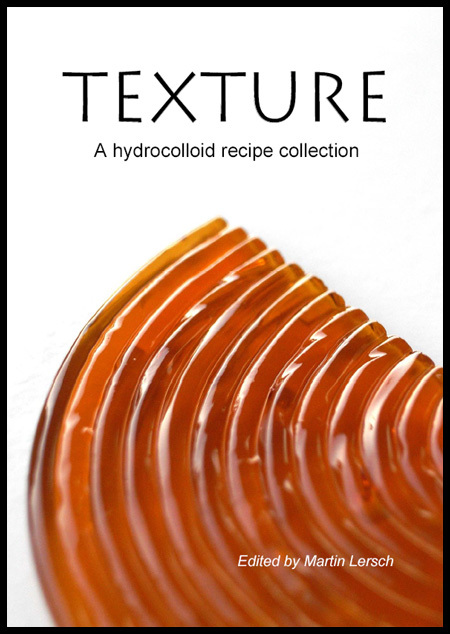 I’m happy to announce that a major update of “Texture – A hydrocolloid recipe collection” is now available for download. Version 3.0 of Texture features many new recipes, , more pictures (A big THANK YOU to all contributing photographers! ), a new chapter on non-hydrocolloid gels + many minor additions and corrections. 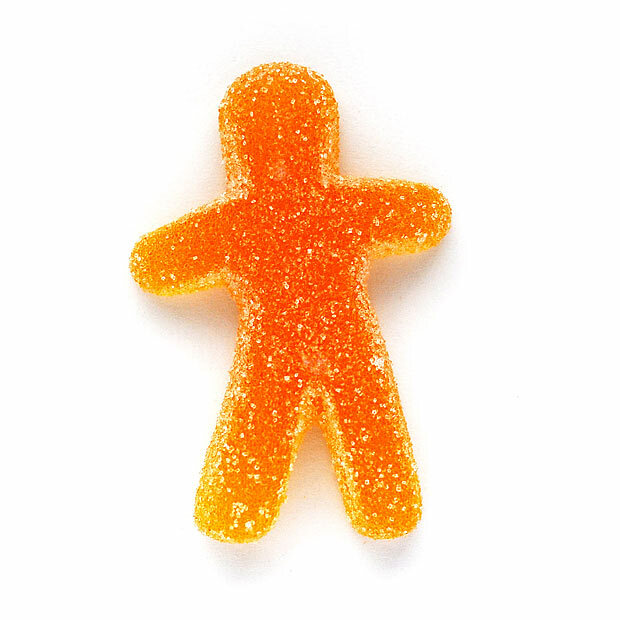 Given the many recent books about molecular gastronomy and modernist cuisine I have certainly asked myself: Is there a need for a revision of Texture? Since you read this I obviously landed on a “yes”. As a toolbox for chefs and amateur cooks I still believe that this collection is unique for several reasons: the ranking of recipes according to the amount of hydrocolloid used, the texture index and the total number of recipes (339 in total). To the best of my knowledge no other cook books have taken the same approach to collect and systemize recipes this way. And judging by the feedback I have received many chefs and food enthusiasts around the world have found Texture to be a useful resource in the kitchen (to which the 80.000 downloads from Khymos alone also testify). I do not regard Texture as a competitor to the numerous books available, but rather as a supplement. Inspiration for cooking is best sought elsewhere, but if Texture can inspire to experimentation with the texture of foods I believe it has fulfilled its mission. Pictures: This is the biggest visual change! Some recipes are now equipped with pictures which may give you an idea of the texture AND they indicate that the recipe has indeed been tested. But I need your help to add more pictures to the recipe collection (please follow the link to read more about how you can contribute pictures)! And of course – a big thanks to those of you who have already contributed your pictures! Recipes: Recipes have been added and the total number is about 310 now. I’m getting a little more picky now with regards to which recipes I add. Ideally each new recipe added now should illustrate something new. I should mention that I’m very grateful for feedback from readers and users of this recipe collection. Thank you very much with helping me improve the document! If you find typos, wish to comment on something or have suggestions on how to improve the collection, please do not hesitate to write me an email at webmaster (at) khymos (.) org or just write a comment in the field below. Please head over to the download page for the links. 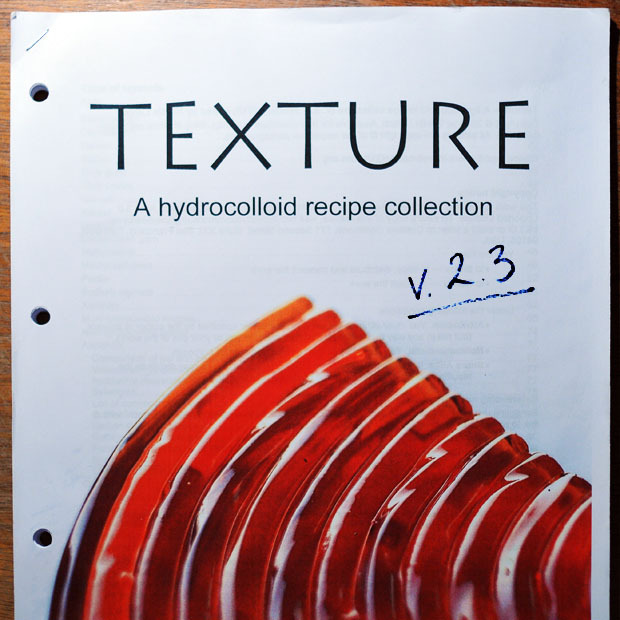 An updated version of “Texture – A hydrocolloid recipe collection” is now available for download (version 2.2). There are two file sizes available: screen resolution (~1 MB) and high resolution for printing (~5 MB). Some recipes have been added bringing the total number up to about 270 recipes. Apart from this the version includes corrections of typos and updates of indexes and the supplier list. There is a new index for alcoholic preparations plus a small glossary. Again I should mention that I’m very grateful for feedback from readers and users of this recipe collection. Thank you very much with helping me improve the document! If you find typos, wish to comment on something or have suggestions on how to improve the collection, please do not hesitate to write me an email at webmaster (at) khymos (.) org or just write a comment in the field below. An updated version of “Texture – A hydrocolloid recipe collection” is now available for download (version 2.1). The version includes corrections of typos, minor additions to the property tables plus an important update in the gelatin section and a recipe for agar filtration. Read on for details! I’m grateful for feedback from several readers pointing out that the size of gelatin sheets is made to compensate for different bloom strengths. In other words, one gelatin sheet will gel a given amount of water, regardless of the size of the gelatin sheet. To the best of my knowledge, this convention seems to have been adopted by most gelatin producers. All gelatin based recipes have been updated to reflect this and most of them now give the amount of gelatin both in grams (for a platinum type, 240 bloom gelatin) and in number of sheets. I’ve also included a formula for conversion between different bloom strengths. This formula differs from what has been published earlier (no square root), but by testing the formula for given gelatin sheet bloom strengths and weights I got better results by simply multiplying the mass by the ratio of the bloom strengths. If you know more about these formulas, please leave a comment or email me. Checking the gelatin recipes I discovered that the recipe “Strawberry spheres” originally called for “Sosa vegetable gelatin” which is not gelatin but a mixture of carrageenan and locust bean gum which are dispersed with maltodextrin. Since the exact amount of carrageenan and locust bean gum are not known I’ve deleted the recipe (but I’m sure you could achieve the same coating effect with plain gelatin, perhaps a 3-4% solution to render it viscous so it will cling the the spheres). Thanks to feedback from a reader there is also recipe now for agar filtration (based on a Spanish forum post). This works just like gelatin filtration, but is much faster. Apparently you get more or less the same results with regard to clarity, flavor and color. If printing the collection, make sure the hydrocolloid properties table is rotated so it prints correctly. This table is presented in landscape format. The right most column of the first page is gelatin – if you don’t see it, try printing these pages again. The pages are optimized for printing on A4. If printing on Letter sized paper, make sure you check the “resize” or “fit to paper” option in your pdf reader. Thank you for comments, corrections, recipes and other feedback! As always, I can be reached at webmaster a t khymos d o t org. It’s a pleasure for me to announce that an updated version of the hydrocolloid recipe collection is available for free download as a pdf file (73 pages, 1.8 Mb). Several new recipes have been added (now counting more than 220 in total), including recipes with cornstarch, guar gum, gum arabic, konjac and locust bean gum. All in all 14 different hydrocolloids are included (plus lecithin which technically isn’t a hydrocolloid). In each section recipes are now sorted according to the amount of hydrocolloid used. The appendix has been updated with tables for comparison of hydrocolloid properties, hydrocolloid densities and synergies. The perhaps biggest change is that all recipes have been indexed according both to the texture/appearance of the resulting dish and according to the hydrocolloid used. Let’s say you want to make spheres, this index will show you which hydrocolloids can be used (that’s right – there are other possiblities than sodium alginate) and list the example recipes. A hydrocolloid can simply be defined as a substance that forms a gel in contact with water. Such substances include both polysaccharides and proteins which are capable of one or more of the following: thickening and gelling aqueous solutions, stabilizing foams, emulsions and dispersions and preventing crystallization of saturated water or sugar solutions. In the recent years there has been a tremendous interest in molecular gastronomy. Part of this interest has been directed towards the “new” hydrocolloids. The term “new” includes hydrocolloids such as gellan and xanthan which are a result of relatively recent research, but also hydrocolloids such as agar which has been unknown in western cooking, but used in Asia for decades. One fortunate consequence of the increased interest in molecular gastronomy and hydrocolloids is that hydrocolloids that were previously only available to the food industry have become available in small quantities at a reasonable price. A less fortunate consequence however is that many have come to regard molecular gastronomy as synonymous with the use of hydrocolloids to prepare foams and spheres. I should therefore emphasize that molecular gastronomy is not limited to the use of hydrocolloids and that it is not the intention of this collection of recipes to define molecular gastronomy. Along with the increased interest in hydrocolloids for texture modification there is a growing scepticism to using “chemicals” in the kitchen. Many have come to view hydrocolloids as unnatural and even unhealthy ingredients. It should therefore be stressed that the hydrocolloids described in this collection are all of biological origin. All have been purified, some have been processed, but nevertheless the raw material used is of either marine, plant, animal or microbial origin. Furthermore hydrocolloids can contribute significantly to the public health as they allow the reduction of fat and/or sugar content without loosing the desired mouth feel. The hydrocolloids themselves have a low calorific value and are generally used at very low concentrations. One major challenge (at least for an amateur cook) is to find recipes and directions to utilize the “new” hydrocolloids. When purchasing hydrocolloids, typically only a few recipes are included. Personally I like to browse several recipes to get an idea of the different possibilities when cooking. Therefore I have collected a number of recipes which utilize hydrocolloids ranging from agar to xanthan. In addition to these some recipes with lecithin (not technically a hydrocolloid) have been included. Recipes for foams that do not call for addition of hydrocolloids have also been included for completeness. Some cornstarch recipes have been included to illustrate it’s properties at different consentrations. Recipes where flour is the only hydrocolloid do not fall within the scope of this collection as these are sufficiently covered by other cook books. All recipes have been changed to SI units which are the ones preferred by the scientific community (and hopefully soon by the cooks as well). In doing so there is always uncertainty related to the conversion of volume to weight, especially powders. As far as possible, brand names have been replaced by generic names. Almost all recipes have been edited and some have been shortened significantly. To allow easy comparison of recipes the amount of hydrocolloid used is also shown as mass percentages and the recipes are ranked in an ascending order. In some recipes, obvious mistakes have been corrected. But unfortunately, the recipes have not been tested, so there is no guarantee that they actually work as intended and that the directions are complete, accurate and correct. It appears as if some of the recipes are not optimized with regard to proper dispersion and hydration of the hydrocolloids which again will influence the amount of hydrocolloid used. It is therefore advisable to always consult other similar recipes or the table with the hydrocolloid properties. The recipes have been collected from various printed and electronic sources and every attempt has been made to give the source of the recipes. Since recipes can neither be patented nor copyrighted, every reader should feel free to download, print, use, modify, and further develop the recipes contained in this compilation. The latest version will be available for download from the static Khymos site and will also be announced here. I would like to thank readers for giving me feedback and suggestions on how to improve the collection. Feedback, comments, corrections and new recipes are always welcome at webmaster (a t) khymos ( dot ) org.